Kristiina Poska was born in Estonia, and studied choral conducting at the Music Academy in Tallinn and orchestral conducting at the Music Academy Hanns Eisler, Berlin. Her debut at the Komische Oper Berlin in 2010 (La traviata) led to her immediately being re-invited for performances of La Périchole, and she was subsequently appointed as First Kapellmeister by Barrie Kosky. Together they developed Die Zauberflöte with the group 1927, which attracted world-wide attention. In addition to many engagements at the Komische Oper, she has appeared at the Vienna Volksoper, Hamburgische Staatsoper, Finnish National Opera, Royal Swedish Opera and Norwegian Opera, as well as Opera Zurich, Basel and Klagenfurt where she received enthusiastic reviews. In concert, she has worked with many orchestras across Europe, including the Estonian National Symphony Orchestra, Radio Symphonies in Cologne, Leipzig, Saarbrücken/Kaiserslautern, Frankfurt am Main and Vienna, at the Vienna Konzerthaus with Camerata Salzburg, at the Mozartwoche Salzburg, Munich Philharmonic, Copenhagen Philharmonic, Gothenburg Symphony, Royal Stockholm Philharmonic, the Estonian Sinfonietta at the Wiener Musikverein, and the Beijing and Tokyo Symphony Orchestra. She has already received numerous international prizes, e.g. the audience prize at the renowned Malko-Competition in May 2012 and the prestigious German Conductors’ Prize in April 2013. 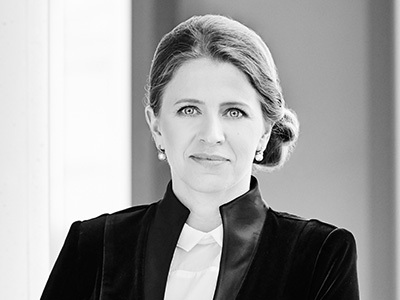 She has been named music director at the Theater Basel for the 2019/20 Season. Current/forthcoming engagements: Philharmonie Zuidnederland, Tapiola Sinfonietta, Norrlandsoperan in Umeå, Gävle Symfonieorkester, Symphonieorkester Vlaanderen and the Royal Northern Sinfonia; Le nozze di Figaro (Maggio Musicale Fiorentino).